Foodslicer.org.uk is a comparison site where we pool together all the best food slicers for home semi professional and professional use. Food slicers are a great way to beat the price crunch at the moment because they allow you to slice foods neatly and effortlessly at an exact thickness, putting you in control of how many portions you get from your meats, breads, cheeses and much more. Which is very useful during these harder times where the cost of everything seems to be going up whilst your budget stays the same. Whether you want your food slicer for home or for your business we will have a food slicer that will do just the job, and if we haven’t then please use the contact button above and give us your requirements/ budget and we will do our very best to find the food slicer to meet your needs. So take a look at our site by using the tabs at the top of the page or alternatively click here if you want to see our range of professional food slicers. This electric precision food slicer is made by Andrew James and is an excellent choice for use in your home. It’s perfect for carving those Christmas Joints of meat to make your food go further, which is an added bonus during the festive period when friends and family pop by to visit. 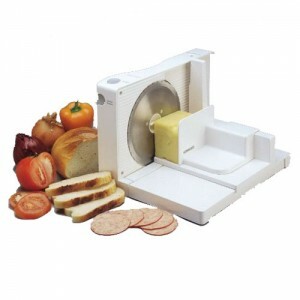 One of the added benefits to this particular food slicer is that is has an extra large 220mm blade making slicing larger joints easier but that’s not all this food slicer is good for, it is also great for slicing super soft fresh bread, cheese, salami, cakes and cold meats and much more. 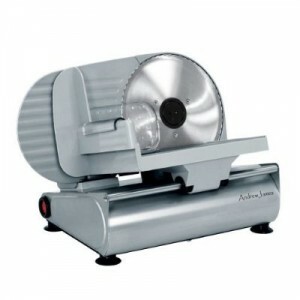 This Andrew James Food slicer would make an ideal Christmas present for someone who likes to eat well but wants to get the maximum yield for their money because having a food slicer is a very economical gadget to own when you consider how much you pay for 3 or 4 slices of meat in the supermarket. Buy this food slicer and never again pay a fortune per kilo because you can buy a joint of gammon, beef or pork etc and slice it yourself making the price per slice very reasonable and you won’t be paying for all that added water and additives. 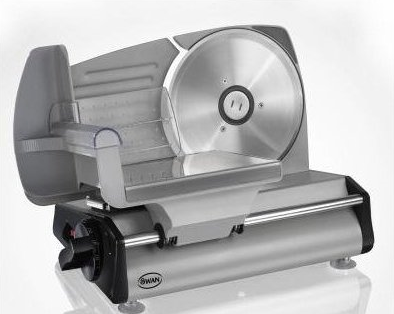 This food slicer by Swan has aluminium die cast housing with a shaped cast steel base. It has a 7.5 inch stainless steel round blade that can slice food up to a thickness of 13mm, which means it’s perfect for slicing meats, vegetables, bread and much more. One of the great advantages of having a food slicer is that if used to slice meat it’s goes a lot further than if you carved the meat yourself because it gives you every slice of meat at the exactly thickness you want. Sliced meats from supermarket are really expensive when you compare them weight for weight with a home roasted joint of meat. Use your food slicer to slice that roasting joint and it becomes a truly economical way of having proper good quality sliced meats that don’t break the bank. It won’t take long for your food slicer to pay for itself and once you’ve had a food slicer you won’t know how you managed without one. 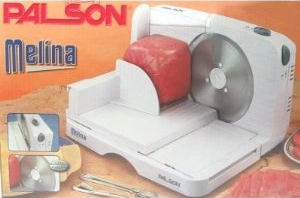 This food slicer is made by Palson Melina and comes complete with a slice collection tray for your added convenience. The blade is made from stainless steel and is detachable for easy cleaning, making it hygienic. Perfect for slicing meats, breads and cheeses as it is easy to adjust the thickness of its slice to suit the food you are slicing. Also included is a food fence for pushing through your food without endangering your hands and it has a safety cut out button for extra piece of mind. 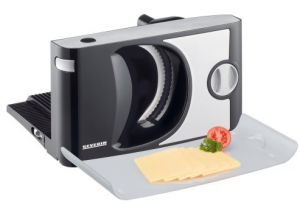 This food slicer is 120w and also comes with a cord storage compartment to neatly keep the cord out of eyesight. Buy this Food Slicer for £37.48 including Free Shipping! Who says a food slicer has to just be functional? 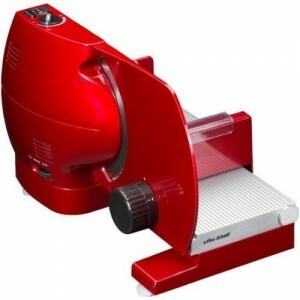 This particular food slicer comes in a fashionable metallic red but as well as looking fabulous it also has all the things you would want from a food slicer. It is a powerful food slicer with a 120 watt motor encased in metallic housing and made by Efbe-Schott who are a German company known for their pioneering success in kitchen appliances. This really is an excellent product with a 17cm removable blade, speed controls from 60-120 RPM, thickness range from 1 – 21 mm, a detachable motor block for easy cleaning, safety switch, non slip feet and much more. This is a food slice to admire for both its looks and its fabulous features. This sleek looking Magimix food slicer comes with a tough all metal body and a 19cm fully protected stainless steel blade which is removable for easy cleaning. It also features an easy glide removable carriage to help you cut through your food with ease. Perfect for all your homes slicing needs it will cut your meats, breads, cheeses and salad with ease and can precision cut up to a 2cm thickness. 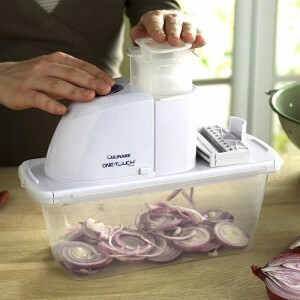 This food slicer has a 120 watt motor, a removable food pusher and has cable storage to keep the cable tidily in place. 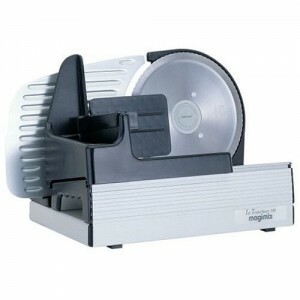 This Magimix food slicer is simple to use and its dimensions are Height 24 x Width 38 x Depth 23cm. This food slicer has a powerful 150 watt motor that powers its 19cm blade to help cut your food with ease. The blade is made from stainless steel which is removable for your convenience. This product can slice all types of meats, breads, cheeses and even vegetables and it has a precision control of thicknesses from 0 – 15mm and it is also easy to clean. 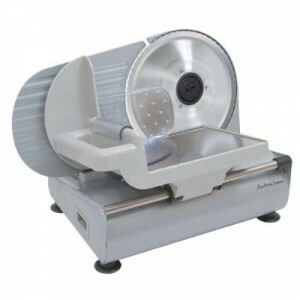 This food slicer is a solid metal unit with steel and aluminium die cast housing and rubber suction cups on the bottom to keep the unit in place. It comes complete with a thumb guard/food press, safety on/off button and is CE APPROVED & ROHS COMPLIANT. When you see the word Kenwood you know you have a brand you can trust with products that are made to a high standard. This food slicer has a 17.5cm serrated blade that can be moved to provide variable slicing widths. It is very easy to put together and to take apart for easy cleaning and is simple to use. This food slicer really is a very useful kitchen gadget to have in your home. It’s perfect for slicing bread, tinned meats like corned beef, hot roasted joints of meats, salads, cheese, Deli style cold cuts and much more. This Kenwood food slicer is particularly perfect for the smaller kitchen because it all packs away back into its small box ready to be used again in the very near future. Buy the Kenwood SL250 Food Slicer for £34.97 with free delivery! This Culinare One-touch Slicer offers buyers the chance to get all that time consuming, often boring and tiresome prep-work done in minutes. Which, makes the whole process of cooking a meal, of any size, that much simpler. With 3 thickness settings (thick, thin and julienne) the Culinare One-touch Slicer caters for all tastes and dishes, and with the food collecting in a box at the bottom of the appliance, it’s as easy as squeezing a lemon. There are no exposed blades, and the box and the blades are both dishwasher safe, so you’ll be saving even more time. Allowing you to savour your meal or an extra glass of wine, rather than having one eye on the washing up. You will never have to worry about slicing your finger by accident or shedding a tear during the slicing of your onions with the Culinare one-touch slicer. So for only £24.99 , the Culinare One-touch Slicer may be the bargain of your lifetime. You will never have to worry about slicing your finger by accident or shedding a tear during the slicing of your onions with the Culinare one-touch slicer. So for only £24.99, the Culinare One-touch Slicer may be the bargain of your lifetime.